Add some Middle-Earth style to your look with this Red Eye of Sauron Collectable Pin! Designed by renowned fantasy artist, John Howe, this stunning pin is Nickel-plated and painted blood red. This pin comes with two fasteners and comes pinned to a themed card sealed for protection in a plastic bag. 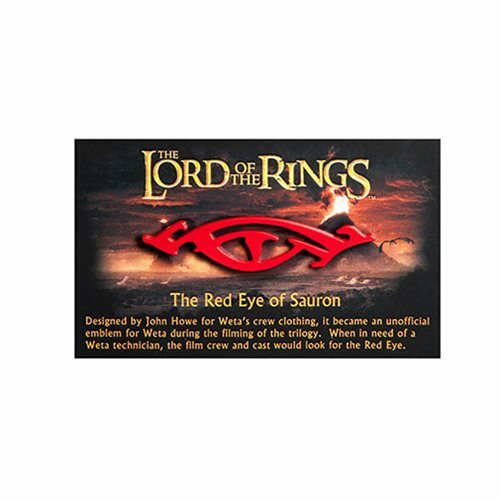 The Lord of the Rings The Red Eye of Sauron Collectable Pin measures about 2 1/4-inches long x 1/2-inches tall. Designed by John Howe for Weta Workshop's crew clothing, the Red Eye of Sauron became an unofficial emblem for Weta during the filming of the trilogy. When in need of a Weta technician, the film crew and cast would look for the symbol of the Red Eye. Now you too can feel like part of the Weta Crew.